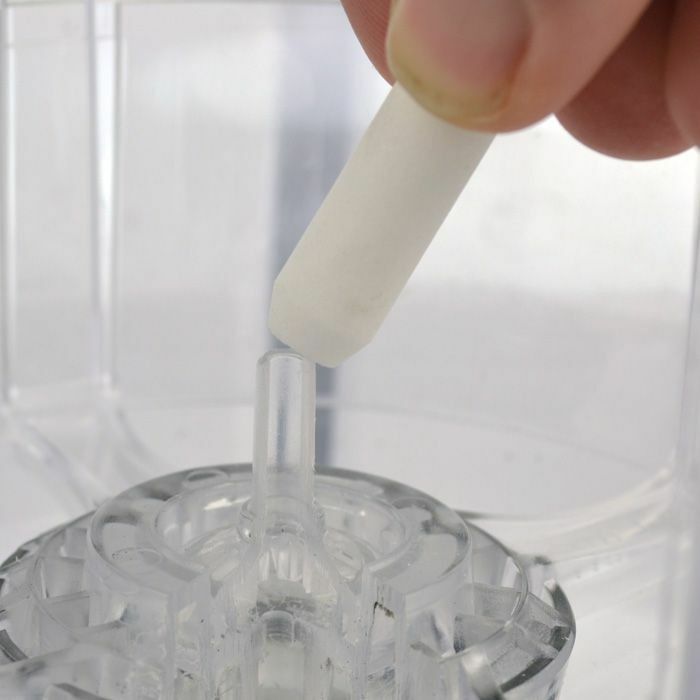 Home › Biorb Articles › How Often Should I Replace the Air Stone In My BiOrb Tank? How Often Should I Replace the Air Stone In My BiOrb Tank? Many new BiOrb and BiUbe tank owners wonder how often they should change out the air stone in their tanks? The short and incomplete answer is, it depends. We frequently get asked the question, “How to replace the biorb airstone” and we wanted to help answer it with this blog post. The biorb air stone is a vital piece to the BiOrb and BiUbe tanks and has multiple functions within your tank. The first function being air flow control. Without the air stone the airflow coming from your BiOrb Air Pump may be too powerful. Too much air will leave the surface of the water agitated which causes stress for the fish. Fish that swim to the surface in order to eat their fish food (in biorb) will be reluctant to eat in such conditions. This can lead to health problems for your pet fish. The second function of an air stone is that the tiny pores within the air stone break up the flow of air into bubbles. These bubbles help calm the flow of air to the surface and more importantly help oxygenate the water in the tank. Independent testing by Reef One has shown that the oxygenation levels in the BiOrb aquariums are better than oxygenation levels in regular fish tanks, this means your fish stay healthier. Oxygen is an essential part to keeping your fish healthy. Over time the tiny pores in the air stone can become blocked by dirt and lime scale preventing air from getting through properly. If the problem is not addressed and there is a lack of oxygen in the water for your fish, it could lead to death. Your local water supply and the overall cleanliness of your BiOrb tank, will determine how long your air stone lasts. It is recommended to change the air stone every three months in order to maintain proper functionality of your tank. This will give you peace of mind that your fish will be happy and healthy. Changing the BiOrb air stones is pretty straight forward. All you need to do is take off the BiOrb service kit and bubble tube, and then slide off the air stone. However, you still need to be careful! The little plastic piece that the air stone slides onto IS NOT REPLACEABLE. It is attached to the base of your aquarium, and if it breaks there is no replacement part or way to get a new one. Avoiding the problem in the first place is the best option.